Today we find out from various press sycophants that ‘President’ Obama really didn’t know that the leaders of 40 nations were getting together in France, because nobody told him. Nobody Knows how many times Obama can use the excuse that he “didn’t know” about whatever (FBI, IRS, Fast and Furious, Van Jones, Benghazi, Obamacare…) Nevertheless… Obama never seems to tire of using the old, “He didn’t know.” excuse for everything. If the Empire State Building got hit by a missile, California was sold to Mexico, or Michelle was raped by Bill Cosby—Obama would be the last to know. This video shows what is happening all over England, France, and Europe. The Muslims have come into those country, and literally taken over entire neighborhoods. And then, they multiply, as the old saying goes, like rabbits. The poor native citizens are forced to fund the Muslims and their families. Feed them. Clothe them. Educate them. Basically—-pay for their own suicide. This is the reason that the leaders showed up in France. Those rich elites will someday, have no control over the Muslims. It hasn’t gotten that bad here…yet. On my street, the Muslims now buy up every house that becomes available…and they lay low. They have big meetings, but they do NOT talk to the neighbors, and basically look at every one who walks by their door with disgust. I live, in the middle of Missouri. My local community center was turned into a Mosque. If you are not a Muslim, you are not allowed. Never in my lifetime would I have imagined that to have happened in America. Never. Wikipedia reports that the overall number of mosques in the United States quietly rose from 1,209 in 2000 to 2,106 in 2010. The number of Islamic places of worship in the United States soared 74% in the past decade. Under Obama, the next two-year, that number will multiply. So, even thought there is quite a bit of cussing in that video, I applaud Tommy Robinson for standing up for his country. Muslims do NOT assimilate. And like the blacks, they don’t want you in their neighborhoods. Nobody Knows how this will end. But, the storm…IS coming. 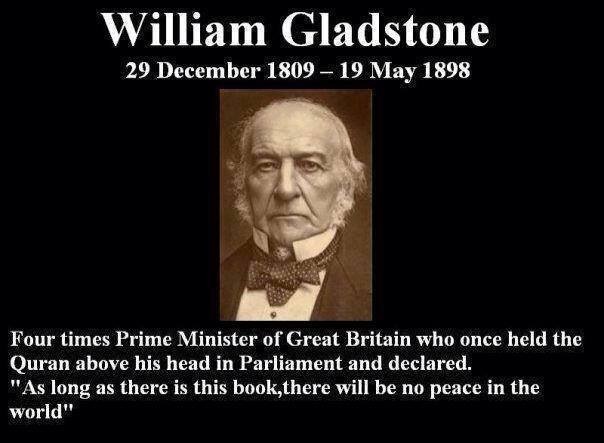 Gladstone, it turns out…was right.